It is said that it is not the strongest of the species that survives, but the most adaptable. 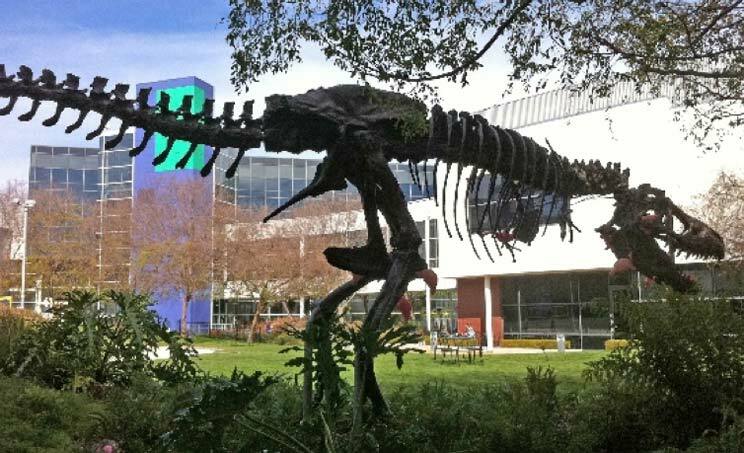 Land-based dinosaurs ruled the Earth for about 160 million years but they are extinct today and only skeletons are left, like “Stan,” a tyrannosaurus that is placed at the Google campus in Mountain View, California as a kind reminder. Business professionals and technology experts agree that the technological revolution we are facing today is just in its infancy. After observing computing power skyrocketing, we are starting to glimpse how a convergence of factors – such as increased digital density, the amount of connected data, and the interactions that may be created – is enabling new kinds of business logic that threaten the status quo. Established firms have confronted the threat of becoming obsolete by opening their innovation strategy to increased exchanges with the ecosystem. Trying to understand how cloud computing, big data, artificial intelligence, the Internet of Things or blockchain technology may affect how we do business today has led to a more acute need to understand how to work and collaborate with the startups pioneering solutions based on these technologies. We see innovation coming from initiatives that combine the best features of corporate research and the startup world. As academics define it, this is a hybrid model in which both startups and large corporations are needed to come up with new solutions for the complex problems we face in business and society at large. It is a fact demonstrated by research and practice that corporations encounter difficulties when they try to make internal disruptive innovation flourish: it is not easy steering an ocean liner. Many reasons, structural as well as cognitive and behavioral, have been given for this. In contrast, startups lead this type of innovation in almost every industry all over the world. A good startup ecosystem proves to be better at shortening the cycles of innovation, exploiting technology, enhancing existing business models, and inventing new ones more quickly and effectively than big corporations. The collaboration between corporations and startups has become crucial. Consolidated brands and businesses have decided to collaborate with start-ups to fast-track disruptive, game-changing products and services. While corporations tend to take more calculated risks and have a slower tempo, startups tend to be small teams of light-structured firms with flat hierarchies that are faster and more willing to overturn existing models if necessary to serve market needs better. These big differences are also the biggest reasons for building bridges between both sides. Incentives for such partnerships are remarkable for both parties. Corporations can benefit from collaborating with startups by sourcing the latest technologies or novel business models, avoiding the inflexibility that firms commonly face when trying to do things internally. In this way, a firm will be better positioned to move ahead in the market against its competitors, facilitating profitable growth and superior performance. However, for that success, it is key to engage in a win-win partnership that benefits the other – and usually weaker – party: the startup. Early-stage high-growth businesses should benefit from the support of bigger and more experienced companies that help them with valuable resources, better sales and supply chain opportunities in exchange for their creativity and ideas. This makes a big difference to startups as they can go to market or scale more easily. It is important to understand and satisfy their needs. Although, according to several research studies, startups interact with corporations mainly to develop strategic partnerships, they may have also other needs that should be satisfied: accessing markets, developing channels, landing new enterprise customers, increasing visibility or obtaining finance or contact with investors or potential acquisitions. Collaboration can build powerful synergies as a result of this complementarity. If the collaboration is undertaken correctly, it can have a very positive impact and minimize each party’s weaknesses, improving the industry as a whole. In this way, the collaboration turns out to be a win-win solution not only for both parties but for the industry and the entrepreneurial ecosystem. It turns out to be a driver of growth for local economies, for the economy in general and for the standard of living of customers, who benefit from advancements in products and services they consume on a daily basis, which enhances their quality of life. 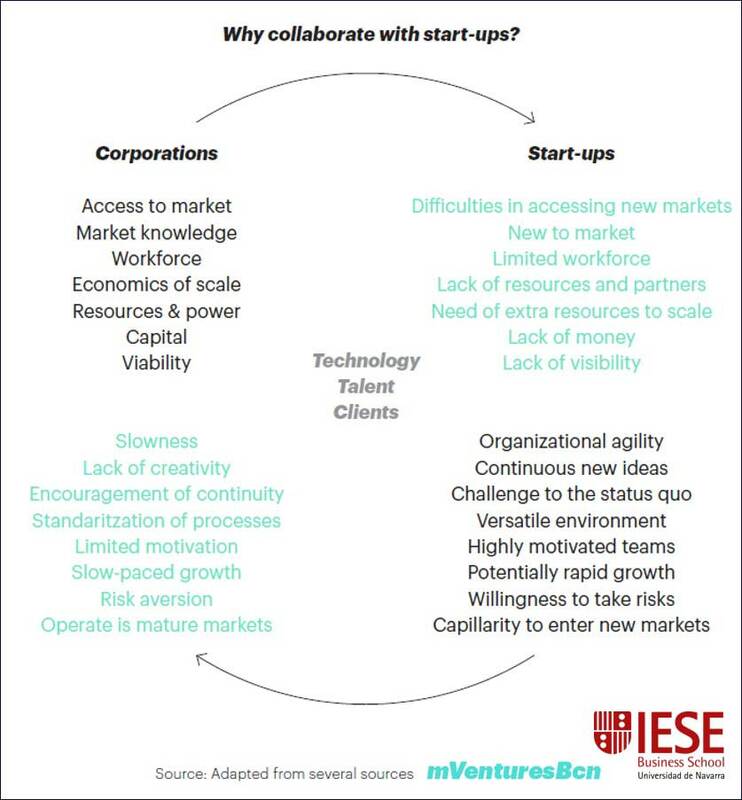 Many large corporations have developed innovation strategies in which corporate venturing is embedded, in the form of corporate venture capital, incubators, accelerators or innovation labs. However, there is not a single best solution and the whole process must be undertaken carefully to achieve satisfactory results. What is important is to be aware that startups could be outsourced R&D for corporations where they can look for innovation, ideas and inspiration. Consolidated companies can use the potential of disruption and growth of startups for a better mutual outcome and produce win-win collaborations that foster economic growth, technological progress and social welfare. Just like different pieces of a complex puzzle, they are very different and seem incompatible, but when they match, they can build a bigger, broader image. This is a very useful article. I’ve shared it on my Fb with the small business owners. Thank so much, However, there is not a single best solution and the whole process must be undertaken carefully to achieve satisfactory results. This is a timely article, very well written. I think the entrepreneurial ecosystem can only grow better with the collaboration of old and new blood. Thanks for sharing this. As per my view the collaboration between corporations and startups should be an important one because startups should interact with the corporate to develop their strategic partnerships.Kindly visit our website for your Transcription Needs! Great Article. Win-Win Partnerships are the best way to grow. Alone will not get far, Together we grow fast and accomplish more. Super post…We totally agree, big corporates must partner with startups…the partnership not only benefits startups but also to big firms by giving them innovation & low development cycles for products. I Do Agree with your views,because the colloboration between the startup and corporation should be an important one to develop the strategies.